SMARTPHONE COMPATIBLE WIRELESS MEAT THERMOMETER: BBQ Dragon’s Smartphone Connected Meat Thermometer is equipped with BT 4.0 and supports iPhone 4s, iPod touch, iPad 3rd generations, and later model phones. It also supports Android 4.3 and later model phones. 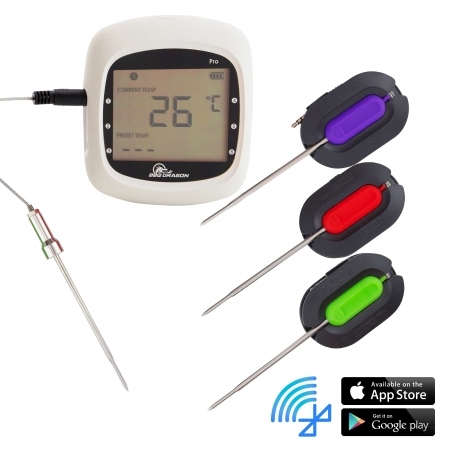 This thermometer comes with a free smartphone app for Apple and Android users. The thermometer has a super long 300-foot wireless range. 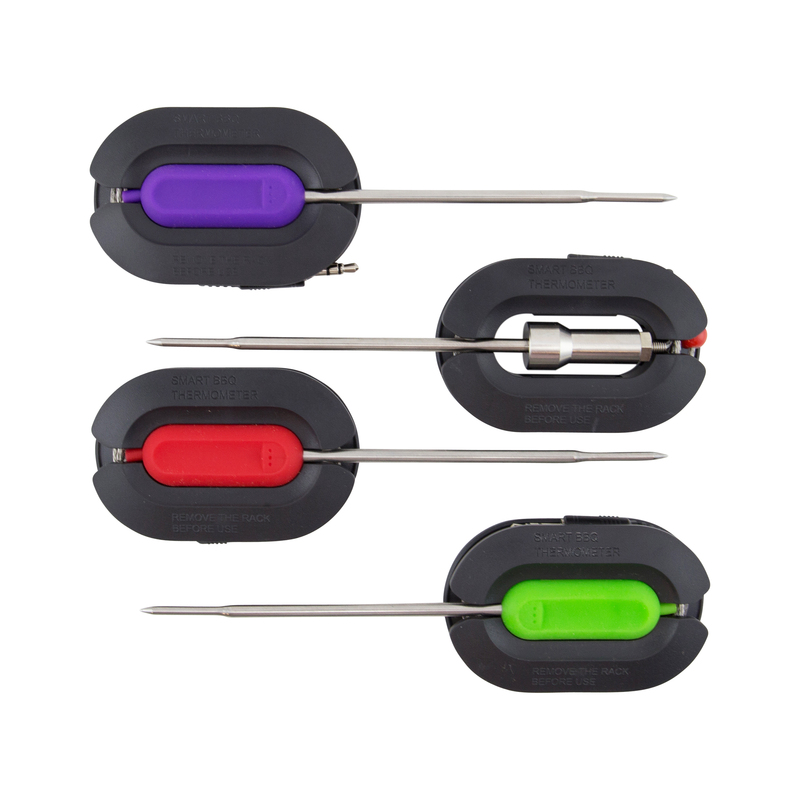 NEEDLE-TIPPED BBQ THERMOMETER PROBES: This thermometer comes with 4 stainless steel probes: 1 completely metal probe and 3 silicone-tipped metal probes. Each is needle-tipped so it can puncture the surface of most meats. 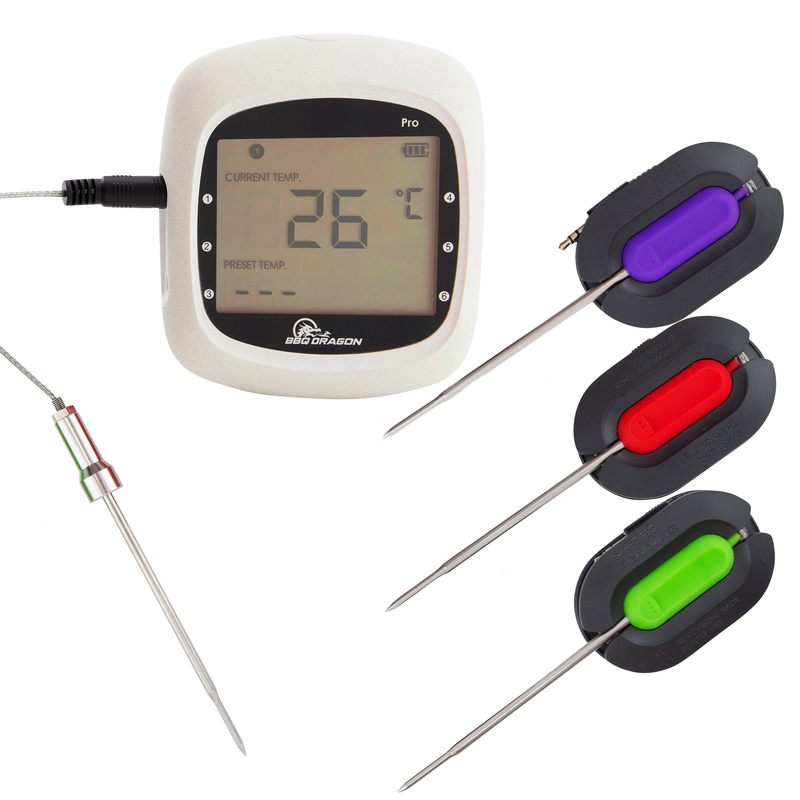 You can easily wash each probe because they can detach from the thermometer reader. The reader supports up to 6 probes. 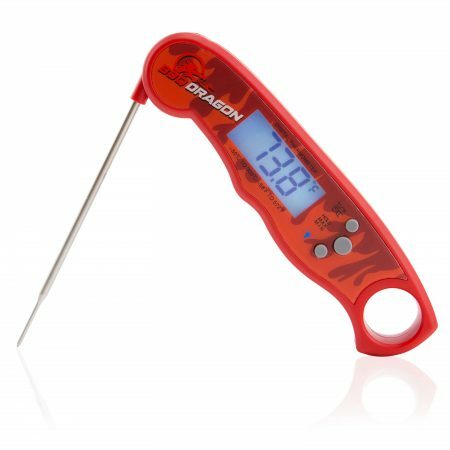 WIDE RANGE: BBQ Dragon’s thermometer measures a wide range of temperatures. The probe measures from 32° F to 662° F (1° C to 350° C) and is highly accurate. 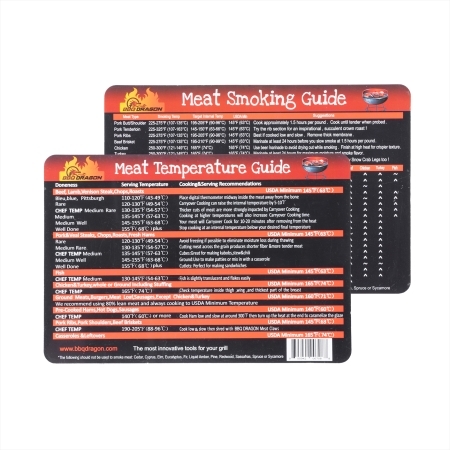 There are 5 temperature settings: rare, medium rare, medium, medium well, and well-done for various meats. 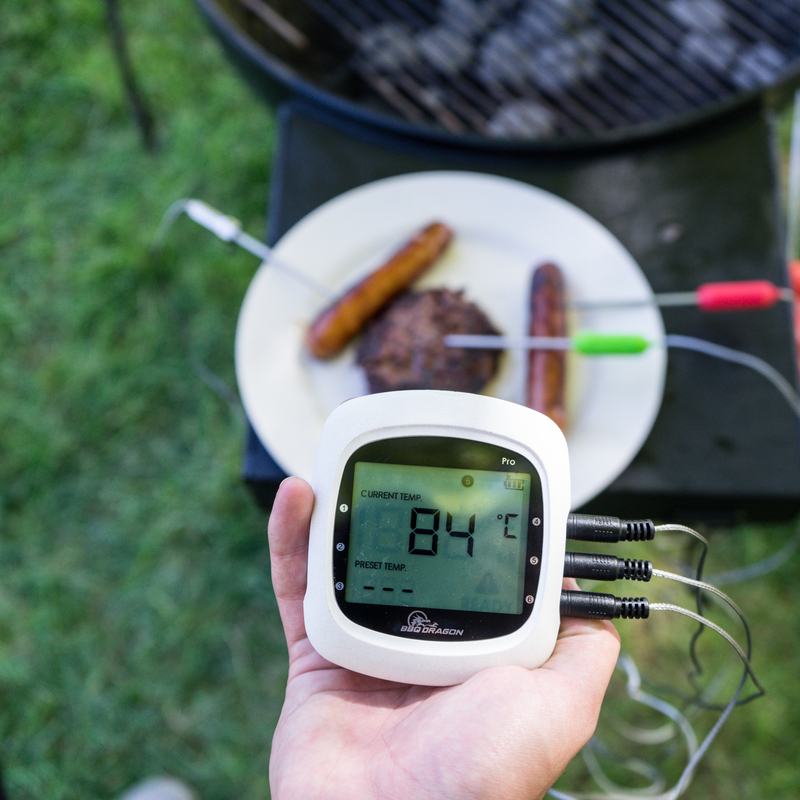 This thermometer is perfect for all kinds of meat grilled outside or cooked inside. BATTERY OPERATED: The thermometer runs on 2 AA batteries (included). It’s been tested to have up to 200 hours of battery life. The backlit display is easy to read, even in harsh lighting. It comes with an alarm that counts down. 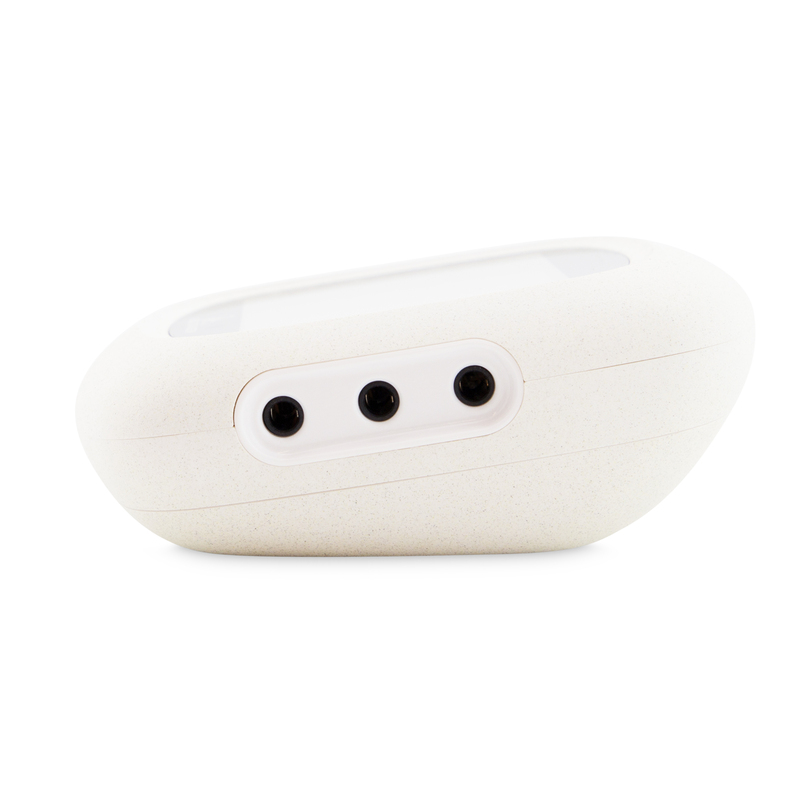 It also has a highest and lowest temperature alarm. The alarm can also be accessed on the app on your phone. BBQ DRAGON QUALITY: At BBQ Dragon, we use high-quality sources to manufacture all of our products. All of our BBQ Dragon products include a one-year satisfaction guarantee. 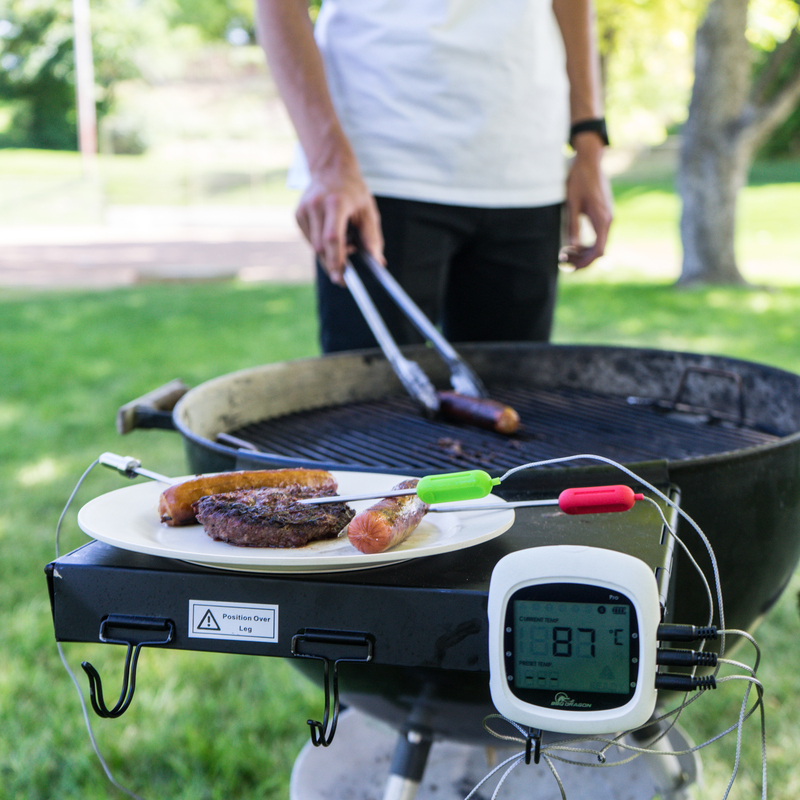 If you aren’t satisfied with the BBQ Dragon Smartphone Connected Meat Thermometer, reach out and let us know. We will send you a new product or refund your money.